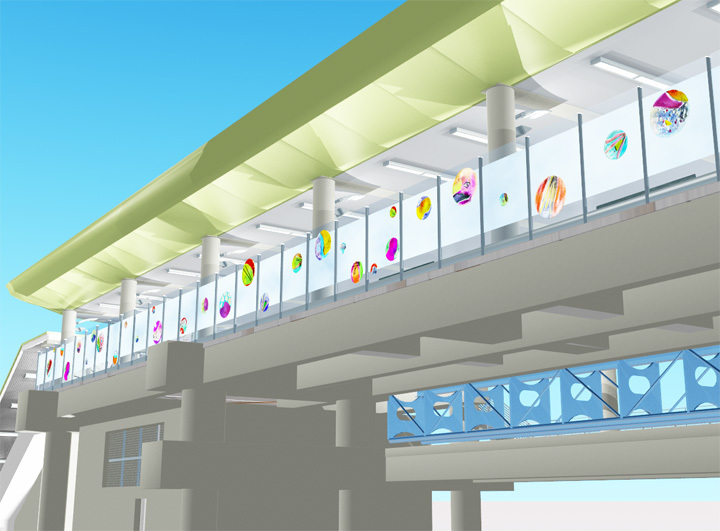 Napa-based artist Gordon Huether was commissioned to do a glass art installation for the exterior walls of the new station. The Oakland Airport Connector (OAC) is an above-ground cable-pulled rail system between Oakland Airport and the Coliseum BART Station. As of Nov. 2014, you can take it between the airport and Coliseum BART!It will set you back $6, but runs frequently, is easy to find, and takes Clipper Cards. The OAC replaced replaced the AirBART shuttle bus system. AirBART didn't take Clipper but it only cost $3. AirBART ran every ten minutes and the travel time varied from ten to thirty minutes, depending on traffic. Photos from opening day here. The OAC has been controversial from the beginning for a number of reasons. First is the cost: it is estimated the OAC will cost nearly $500 million when completed. For comparison, the West Dublin/Pleasanton BART station built in 2010 cost $80-90 million. This expense in construction will likely lead to higher fares on the OAC, estimated $6 per trip, compared with $3 per trip for AirBART. Transit advocates suggested the creation of Bus Rapid Transit (BRT) lanes between BART and the airport as a less expensive way to minimize the impact of traffic for AirBART riders. It may simply be they're still working the kinks out of the system, but the OAC broke down twice in one week. Once because a piece of plastic blew onto the track and got into some machinery, and another time an electrical problem partially shut down the system. Ironically, the backup is buses, not unlike the old AirBART.